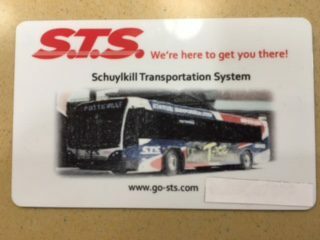 PRESS RELEASE – The Schuylkill Transportation System (S.T.S.) is introducing its transit “Smart Cards” along with a more “Simplified Fare Structure” to provide convenience of use and encourage the general public to take a ride on their fixed route bus system. The debut of the “Smart Card” and the “Restructured Fare Rate” was held February 1st. Both will widely reflect the Schuylkill Transportation System’s Mission Statement… To meet the public transportation needs of Schuylkill County residents while providing safe, dependable and cost effective transportation. The re-loadable “SMART CARD” is offered for purchase at the S.T.S. St. Clair facility or Union Station located in Pottsville. According to S.T.S., once a passenger’s card has been established and a dollar amount has been uploaded, riding S.T.S. fixed route couldn’t be easier. The passenger just simply taps the device adhered to the vehicle’s fare box and the amount is automatically subtracted from the card. S.T.S. fixed route drivers will also have the capability of applying money to a passengers established “SMART CARD” at time of passenger boarding. Registered Senior Citizens will continue to ride FREE and cash fares will still be accepted for those riders who may choose to forego the convenience of a “SMART CARD”. The Schuylkill Transportation System also announces in addition to the cards, a newly “Restructured Fare Rate” has also been established. This restructured fare will allow all fixed route passengers to ride for only $1.45 one way to the destination of their choice regardless of distance traveled; however, an inexpensive twenty five cent transfer may still apply in cases when passengers transfer from one route to another. For more information, visit www.go-sts.com.